In 2016 March Royal Enfield launched the highly desired Himalayan bike and it is sold for a price of Rs 1.55 lakh (ex-showroom price). 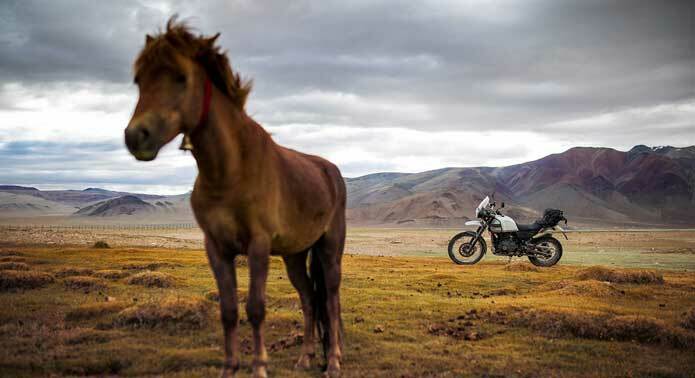 Royal Enfield Himalayan is the first purpose built motorcycle to launch in India. This bike is designed for people who are into thrilling adventures. Royal Enfield Himalayan is constructed with high-tech features and is it powerful enough to out beat Mahindra Mojo also a high selling bike. In 2016 February Mahindra Mojo was sold in higher numbers compared to the even the famous Honda CBR250R bike. Now for the interesting question which is a better bike to buy Royal Enfield Himalayan or Mahindra Mojo? Let us compare the two bikes and find out. Mahindra Mojo has a unique design and the features that highlight the classy nature of the bike is twin headlights with LED guides, Pirelli Diablo Rosso II tires and 43mm upside down forks. The Mojo has a design that is captivating at first sight and anyone would want to buy this bike at the very next instant. It is a comfortable experience to ride the Mojo, it has an impressively huge 21-liter tank and the other reliable features present are shift light, side stand indicator, odometer, trip meter and maximum achieved speed. Royal Enfield Himalayan bears a sporty design and it looks like a true blue adventure bike. This bike is revered for having superb ground clearance, long travel suspension and dual sport tires. Enfield Himalayan is built to offer top-class off-road movement as well. The engine capacity of Royal Enfield Himalayan is supreme; it is engineered with a new innovative air cooled engine built with long stroke engine technology. The engine emission is passed through carburetor and it has a phenomenal displacement of 411cc and generates 32Nm and 24bhp. The high torque output is emitted when the bike is in the strong low and mid-range. The engine rhythm of Royal Enfield Himalayan is known to be greater than any other Enfield bike. The noise and harshness levels are not too high as well and it is just over 5,000rpm, for people who enjoy biking safely at top speeds than the Himalayan is just superb. It can move at a top speed of more than 125kmph. The most pleasurable ride is offered at 90 to 95kmph. Mojo runs on a 295cc four stroke single cylinder liquid cooled fuel injection engine that yields efficient energies of 30Nm and 27bhp. Riding the Mojo is known to be a pleasurable experience contributed by the smooth acceleration power at mid-range speeds and the change of gears is flexible as well. This is a great bike to ride on highways as well and there is no room for any kind of jerkiness even at a high speed of more than 100kmph. The highest attainable speed is 139kmph. The ride quality offered by Mojo is great and it has a powerful suspension system facilitating smooth ride on all kind of road terrains. This bike however is not too efficient while turning on corner roads. The grip capacity while in motion is impressive contributed by the robust Pirelli tires. The movement of the front wheel is however not very strong and owners will have to utilize extra energy to move forward and sources say the reason for this could be chassis or long wheelbase. The ride capacity of Royal Enfield Himalayan is said to be much better than Mahindra Mojo. The suspension and braking system is robust enabling enjoyable ride atmosphere on any type of road condition. An important point to remember is Royal Enfield has engineered the Himalayan to cruise effectively on off-roads. The Himalayan offers a flexible ride while taking a corner road and while moving through traffic at different speeds. Mojo is built with rear and front discs and the quality of braking technology incorporated into this bike is powerful. The Himalayan and Mojo do not have ABS; the brake quality of Mojo is good but additional pressure is needed for initial movement. Design wise Mahindra Mojo and Royal Enfield Himalayan are equally attractive, both bikes are design to offer killer looks, a representation of typical sporty adventure bikes. The two bikes have sufficient features to cater to a safe long distance ride. The engine capacity of Himalayan is far superior to Mojo, but both bikes emit equally efficient energy efficiencies. With regard to acceleration potential Himalayan is a better bike, it can move at speeds of more than 125kmpl whereas the Mojo can hit a highest speed of 139kmph and it cannot go faster than this speed. The ride and handling quality of Himalayan is superior than Mojo, since Himalayan can traverse through corner roads with ease and Mojo is not very efficient on corner lanes. Mojo is not built to offer a high rhythmic movement power mainly because of the long wheelbase. Himalayan on the other hand offers a supreme ride quality. Safety wise the concern with Mojo and Himalayan is the lack of ABS. Now for the important question which is a better bike to buy Mahindra Mojo or Royal Enfield Himalayan. Mojo is just as pricy as Himalayan sold at Rs 1.69 to 1.81 lakhs (ex-showroom price). Across most departments Himalayan is more powerful and it is therefore a better purchase. From the viewpoint of value for money Mahindra Mojo is also a superb bike to own, to enjoy all the pleasures of a first-rate bike. It has a fantastic design, excellent engine and features and powerful ride braking and handling. The Mojo and Himalayan are representatives of world-class bike technology and both offer excellent value for money. For now, Himalayan is the better bike to buy for people who want to explore world-class adventures. This is a unique bike and will offer unexplored enjoyable experience, so buy this bike and enjoy every bit of adventure. So venture on an amazing vacation on the Himalayan and you can be sure of feeling incredibly safe.